Junior Alyssa Acevedo (Medina), sophomore Cirrus Robinson (Ashland), sophomore Megan Sievers (Strongsville), and sophomore Morgan Smith (Tiffin/Calvert) won All-Ohio titles to lead Ohio Wesleyan at the All-Ohio Division III championship, hosted by Otterbein University on Saturday in Westerville. Otterbein won the meet with 109 points to 106 for Mount Union. 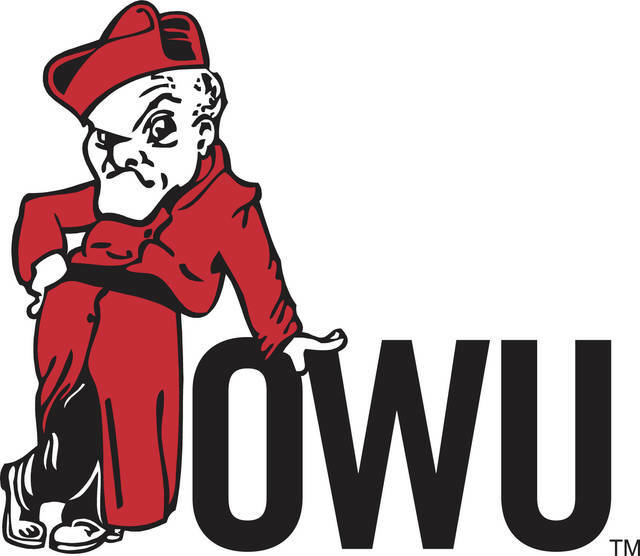 Ohio Wesleyan finished third with 87 points, followed by Ohio Northern (67), Oberlin (66), Case Reserve (61), Capital (34½), Heidelberg (32), and John Carroll (27). Baldwin Wallace rounded out the top 10 teams with a score of 26 points, followed by Kenyon (21), Wittenberg (20), Wilmington (14), Wooster (10), Muskingum (7½), Denison (7), Bluffton (5), and Defiance (0). Acevedo won the 60-meter hurdles in :09.18. Robinson won the high jump by clearing 5-7¾, tying the meet record for the second consecutive season. Sievers won the long jump with a leap of 18-1¾. Smith won the 800-meter run in 2:17.23. All-Ohio honors also went to sophomore Tiffany Moore (Cleveland/Euclid), who finished second in the high jump. Senior Emily Brown (New Concord/John Glenn) won All-Ohio honors in the pentathlon with a second-place finish in last week’s multi-event competition and added a fifth-place finish in the triple jump on Saturday. The Ohio Wesleyan 1,600-meter relay team of freshman Courtney Owens (Columbus/Gahanna Lincoln), Smith, Brown, and Robinson won All-Ohio recognition by finishing second, as did the 800-meter relay team of Robinson, Brown, Sievers, and sophomore Jaliyah Atkinson (Columbus/Groveport Madison) with its third-place finish. Other standouts for the Bishops included Owens, who finished fifth in the pentathlon; freshman Erin Ross (Middlefield/Cardinal), who placed seventh in the 60-meter hurdles; and freshman Cloie Riedlinger (Marion/Harding), who was seventh in the pentathlon and eighth in the long jump. The Bishop distance medley relay team of freshman Destiny Braden (Granville), freshman Makayla Trebella (Girard), junior Rachel Bush (Mount Gilead), and sophomore Erica VanHoose (Marysville) placed sixth. Sophomore Ryan Lesmez (Arlington, Va./Yorktown) and freshman Cade Richeson (Worthington/Thomas Worthington) won All-Ohio championships to lead Ohio Wesleyan at the All-Ohio Division III championship meet, hosted by Otterbein University on Saturday in Westerville. Mount Union won the meet with 143 points to 96 for Case Reserve. Ohio Wesleyan finished third with 79 points, followed by Heidelberg and Baldwin Wallace (54), Otterbein (52), Capital (44), and Wittenberg (26). John Carroll and Ohio Northern tied for ninth place with 25 points apiece, followed by Denison (21), Marietta (19½), Bluffton (18½), Wooster (14), Defiance (11), Wilmington (8), Oberlin (7), and Muskingum (5). Lesmez won the mile run in a time of 4:22.38. Richeson won the shot put with a throw of 53-11¾. Senior Nate Newman (Chillicothe/Zane Trace), who won the heptathlon at last week’s multi-event competition, finished second in the high jump on Saturday to take All-Ohio honors in that event. Newman also finished sixth in the 60-meter hurdles and the long jump and was eighth in the pole vault. All-Ohio honors also went to freshman Marquis Sena (Bronx, N.Y./Institute for Math & Science), who finished third in the 60-meter dash; and the 800-meter relay team of junior Delontaye Morrow (Medina), junior Tommy Davis (Clyde), Sena, and senior Griffin Peyton (Cincinnati/Anderson), which placed third. Other standouts for the Bishops included sophomore Jayson Blankenship (Medina), who was fourth in the heptathlon and sixth in the pole vault; Morrow, who finished fifth in the 60-meter dash and seventh in the long jump; sophomore Nate Minic (Bradenton, Fla./Lakewood Ranch), who finished eighth in the heptathlon and the long jump; and sophomore Darcy Isaiah (Akron/Firestone), who placed eighth in the 800-meter run. The Bishop distance medley relay team of senior Nick Horton (Westerville/North), freshman Kyler Brock (Zanesville/New Concord John Glenn), freshman Kudzovi Nuakey (Canal Winchester/Groveport Madison), and sophomore Ahmed Hamed (Hilliard/Bradley) finished fourth.